They make you want to jump right in! 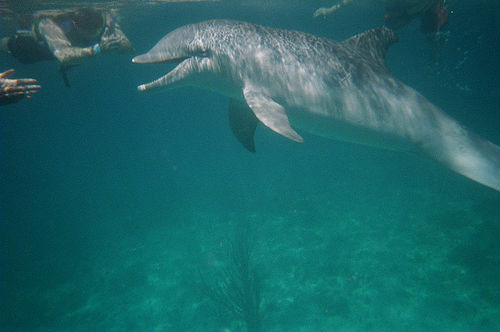 Ever experienced swimming with dolphins in the great deep blue?These underwater dolphin pictures will give you a glimpse into the thrill I once experienced returning from a dive. We had just done 2 wonderful dives at Speyside, Tobago dive site. I was looking forward to a warm dinner and for a moment I leaned back in my seat enjoying the sea spray as it lightly caressed my face as the boat whizzed us back to our destination. They swam playfully...with that trademark constant grin. Maybe they were really laughing at me... My adrenaline was through the roof and I could not breathe fast enough! 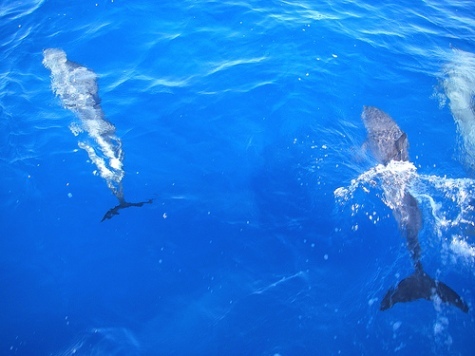 I had never swam with dolphins in the open seas like that before! I will never forget that experience, I even think I was left with a grin as wide as theirs when we got back to Man-O-War Bay Cottage. 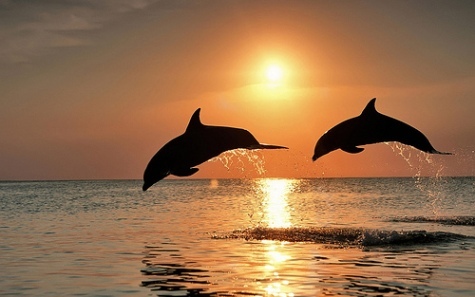 I cannot resist these beautiful dolphins perfectly photographed with the sun setting in the background.